As you probably noticed while browsing the Settings menu, the tabs called ‘Sensors’ and ‘E-Bike’ come locked. On these, you have the option of extending your phone’s capabilities by purchasing certain packages. To do so, tap the ‘Shop’ button to be redirected to the Shop. To access the Shop from the Main menu, tap the Add features button at the bottom right of the screen. Under ’Hardware packages’ you will find expansions that provide support for specific hardware, such as the Teasi Core computer. Once you purchase a device listed here, the functionality will be unlocked for free as part of the device’s feature set. To link a device to the application, either tap the appropriate package and then tap the ‘+‘ button or go to Settings/Sensors and let the phone look for the hardware. Once found, pair it according to the description in the article. 1. Turn on Bluetooth on your smartphone. 2. Turn on the Teasi Core. 4. In the Main Menu, tap the ‘Shop’ button (at the bottom right of the screen, denoted by a symbol). 5. Scroll to the bottom of the screen and tap ‘Hardware Package’. 6. Select ‘Teasi Core Package‘. 7. Tap the “+” (plus) symbol at the right of the ‘Teasi Core Package’ field. 8. 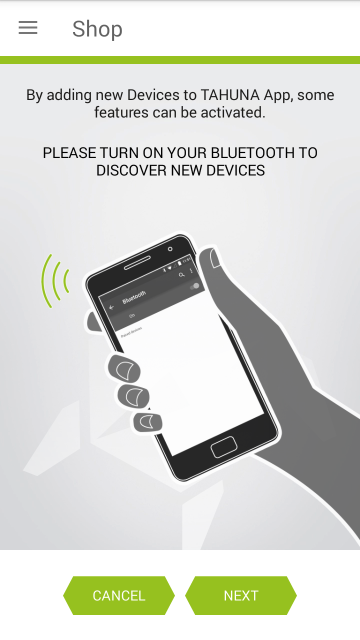 The app will begin to scan for nearby Bluetooth transmissions, find the Teasi device and connect to it. 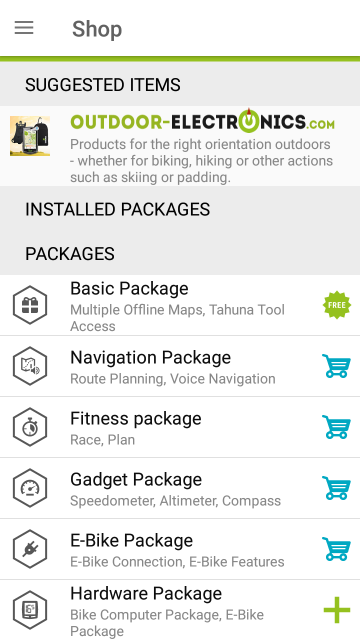 This way the Teasi Core package will be redeemed and you will have access to the ‘Gadgets’ and ‘Navigation’ packages. 1. Open the ‘Settings’ menu from the Main menu (at the bottom left of the screen, denoted by a ‘gear’ icon’. 2. Swipe right to until you get to the ‘Sensors’ screen. 3. Look for your Teasi core in the list and tap its line to pair it to your phone. 2. Turn on the console of your Fischer E-Bike. 4. In the Main Menu, tap the ‘Shop’ button (at the bottom right of the screen, denoted by a “+” [plus] symbol). 6. Select ‘Fischer E-Bike Package’. 7. Tap the “+” (plus) symbol at the right of the ‘Fischer E-Bike Package’ field. 8. Tap the input field and enter your frame number (please see the graphical aid displayed on your phone to locate it). 9. 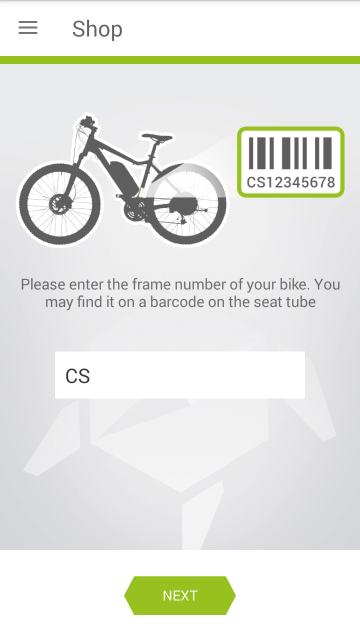 The app will begin to scan for nearby Bluetooth transmissions, find the bike and connect to it. This way the E-Bike package will be redeemed and you will have access to the E-Bike dashboard within the ‘Computer’ menu. 2. Swipe right to open the ‘E-Bike’ screen. 3. Look for your Fischer bike in the list and tap its line to pair it to your phone. If you haven’t done so up until this point, you can unlock the Basic package with a free registration or you can purchase it if you don’t feel like filling out the form. 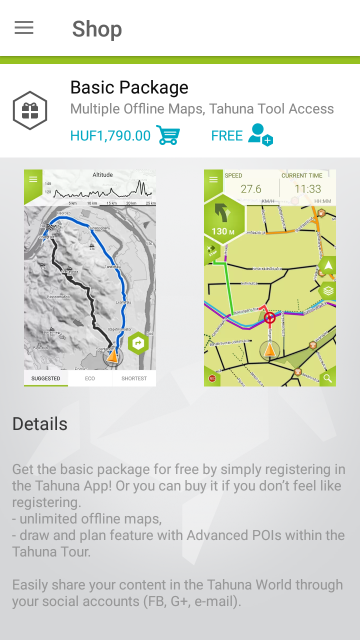 This will let you import GPX files with the TAHUNA Tool desktop application. Please note, that despite having purchased the Basic package, you will need a Tahuna account to share your trips. This is also true for the Shop redeem (features unlocked for free by the purchase of e.g. 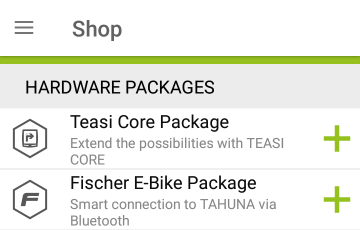 a Teasi Core or a Fischer E-Bike), as this needs to be linked directly to your Tahuna account. You will also get the ‘Draw’ function. This package provides voice guidance in all supported languages and the possibility of creating custom routes while also providing unlimited navigation. 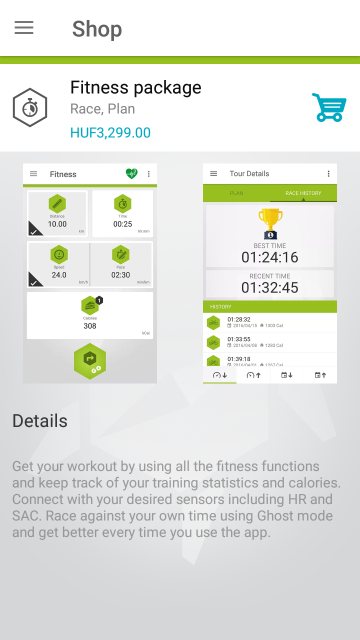 Purchasing this package allows you to keep track of your training and calories with the recorded statistics. You can also try to beat your own time in Ghost mode, racing against your previous best effort. The feature enables you to pair your different sensors, such as a Speed and Cadence sensor or a Heart Rate Monitor to enhance your workout and give you important statistics. 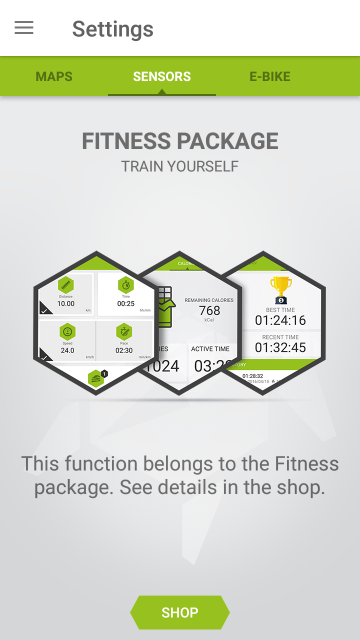 Once you have unlocked this package, its functionalities will be available through Main menu/Fitness. 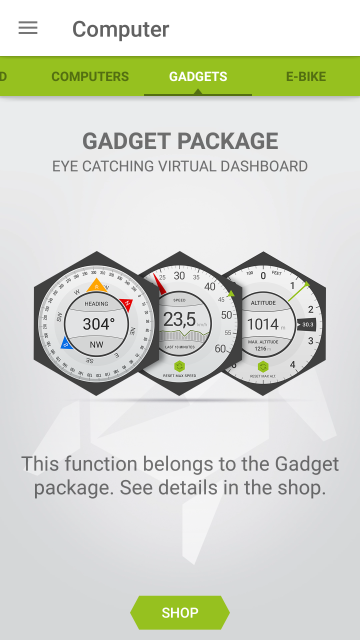 Purchasing this package lets you visualize certain kinds of data on handy gauges. 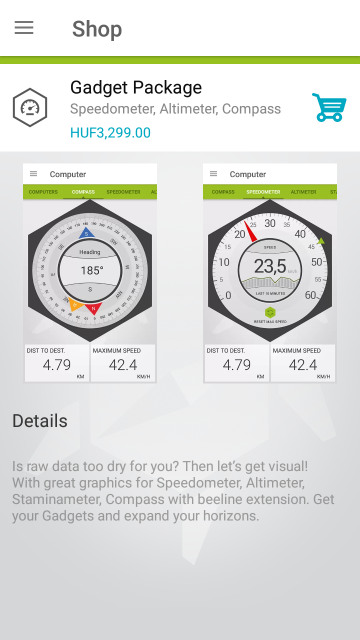 You can view your speed, your stamina, your altitude and even a compass. 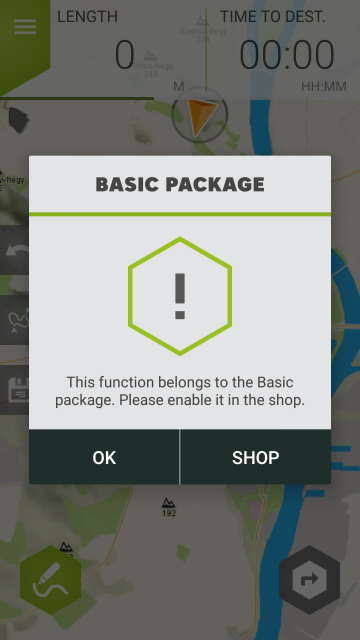 Once you have unlocked this package, its functionalities will be available through Main menu/Computer. 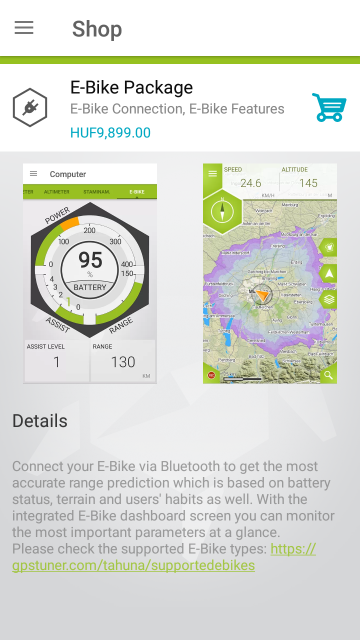 You can connect your E-bike via Bluetooth and have a full dashboard on your phone screen! The most important data such as the remaining battery power, the assist level and the range can be seen at a glance. The Map screen gets enhanced by our signature Heat map so you can see an incredibly accurate range prediction based on the battery status, surrounding terrain and other users’ habits. 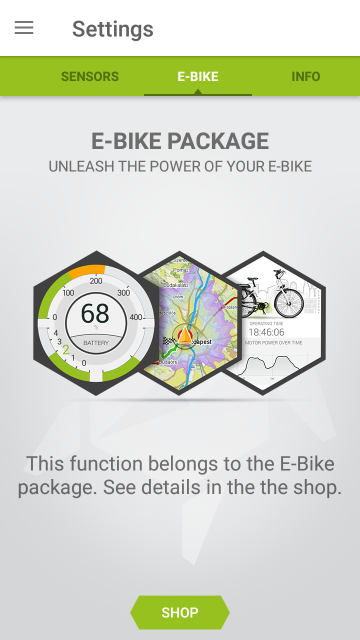 Once you have unlocked this package, its functionalities will be available through Main menu/Computer/E-Bike dashboard.